A large gathering of Rotarians from the six Rotary Clubs in Thanet, members of Inner Wheel and friends assembled at St Augustine’s, Westgate-on-Sea to witness the final moments of David Guy’s Presidency as he handed over the reins to our new President, James Croall. Out-going President David outlined the highlights of his excellent year as President, characterised by much fun & fellowship together with outstanding support of local and national charities. 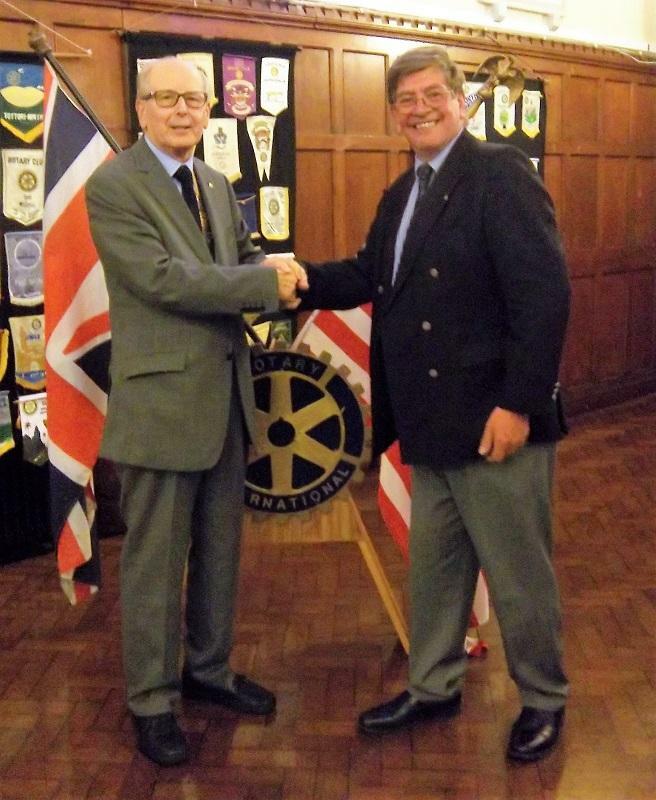 President David was delighted to announce that we had raised many thousands of pounds for the Kent, Sussex & Surrey Air Ambulance, “Porchlight” (an excellent local charity) and the Alfie Gough Trust (supporting children suffering from Neuroblastoma). He thanked our local communities for supporting these charities so generously. Having been presented with the Presidential chain of office, our new President James illustrated the direction he wished the club to follow in the coming year and introduced his team of officers and committees who have pledged to support his vision for the Club. Again, “fun & fellowship” feature strongly in the forthcoming programme and tremendous efforts will be expended to support President James’s nominated charities, The Pilgrim’s Hospice in Thanet and Macmillan Cancer Care (concentrating on local Breast Cancer Support).